If you need a resource who has specific skills, then you can filter your address book so it only shows the resources who have these skills. 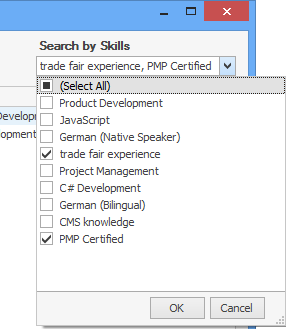 To do so, click on Search by Skills on the upper right-hand corner of the dialog window and select the skills you need. It is possible to select more than one skill. Please note When you filter by skills, all resources which have at least one of the specified skills are shown, not just the ones that possess all of the selected skills. Please note You can define Skills in the InLoox Options and specify which resources in your company have which skills. 4. Confirm with OK. The new team member is sorted into the automatically created Standard Team. Tip If a team member works on several projects, then you can just copy that member per drag-and-drop. Add a new resource | InLoox 9 for Outlook • Copyright 1999-2019 © InLoox, Inc. All rights reserved.